You are here: Home » MEDIA » Books » Doctor Who: The Glamour Chronicles: Deep Time by Trevor Baxendale (book review). 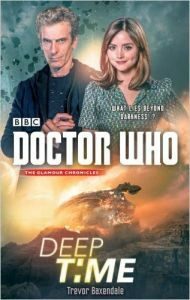 Doctor Who: The Glamour Chronicles: Deep Time by Trevor Baxendale (book review). The final novel in ‘The Glamour Chronicles’ trilogy is ‘Deep Time’ by Trevor Baxendale. Set in space and time itself, so altogether we have the three tropes of the Who-verse. Earth, another planet and deep space. It’s only missing a history episode to fill up the quota. Just remember guys, Douglas Adams never let the word ‘trilogy’ get in the way of producing 5 novels! Clara’s awol from marking this time as the Doctor takes her on a deep space expedition to find a wormhole. The team of explorers are lead by Raymond Balfour, who is fronting up the funds for Professor Tabitha Vent to find the final wormhole created by the ancient race known as the Phaerons before they disappeared from the universe forever. The Doctor knows there is danger here and wants to help them. Get to know these people at your peril, though, as you, the readers know they won’t all make it out alive. The curious cast who would no doubt make a colourful collection on screen include a Navigator, Jem, permanently plugged in to the ship; a sensitive soul who hears the songs of the stars and not only the rich as Croesus, Balfour BUT the shifty Marco Spritt, the archaeologist, a quirky ship’s engineer known as Hobbo. She’s Kaylee from Firefly, isn’t she? Add in the old stager engineer, Mitch, Medic Tanya Flexx, Captain Dan Laker and there are so many opportunities for ways to dispose of them. This story combines the ideas of Einstein, Hawking, et al into theories of space travel and the idea that the universe was once traversed by worm-hole super-highways. Of course, the journey is by no means an entertaining team building exercise and as the ship goes out of control and they fall into the wormhole, you know it’s not going to be all puppies and sunshine down there. I liked the clever plot and it had plenty of pace and action with some pithy asides that we love so much in ‘Doctor Who’. It felt like a satisfying ending to the trilogy, even though it is a extremely loose three-parter. There is also the ‘fun’ of deciding who is going to still be alive at the end. Overall then, the trilogy was great fun and a nice reminder of the talented crew that produce some very readable books about our favourite Doctor which have always kept us going in those dark times (however long) between series. You don’t have to read all three and you may have a preferred style/author or, if you are like me, just gobble up all three. « Doctor Who: The Glamour Chronicles: Big Bang Generation by Gary Russell (book review).